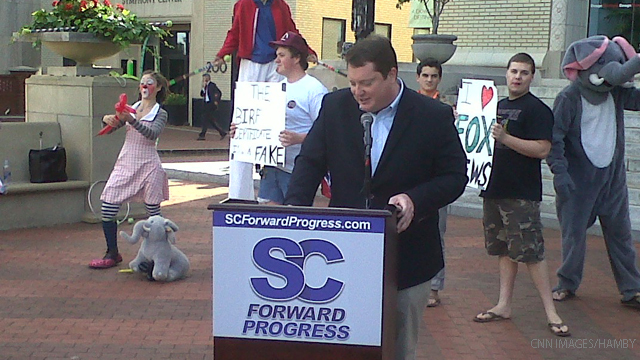 Greenville, South Carolina (CNN) - South Carolina Forward Progress, an independent group formed this week by a group of Democratic operatives, held a carnival-like press conference outside Thursday's Republican presidential debate in Greenville, South Carolina. Lachlan McIntosh, one of the group's founders, mocked the five candidates appearing in the debate, calling the Fox News production a "circus" and "a celebration of extremism." "Every circus needs a good sideshow," McIntosh said, gesturing to a handful of jugglers, clowns, "birthers" and a man dressed as an elephant dancing behind him. That's exactly what this debate is. GOP clowns. love it! Who's going to run Fox's fair and balanced programming now that the entire Republican network is running for President? They should continue to develop their street-entertainment skills. After the shellacking is completed in 2012, there will not be much left to do as a Democrat. Maybe they could get some gigs at birthday parties and bar-mitvahs. This is the period that Americans need to come together as a family but unfortunately the G o pees are pulling us apart. Who is going to watch it? I don't even know what channel it is on and don't care!!! It's unfortunate, but it's true and appears the GOP can't disclaim it just like the circus must go on. ready to "Eat Their Own" and so they will take care of each other, and we will have fewer Republicans to deal with later on. This is hilarious......perfectly fits the circus of republican pretenders!!!!!! In looking at the announced repuclican candidates so far, they wouldn't even make a good circus; a circle jerk perhaps. So South Carolina is the stage for the first TeaPublican showing of some of its Seven Dwarfs. How fitting for them to show up in the state responsible for the opening Confederate salvo of the Civil War. These people haven't even made it into the 20th century, much less the twenty-first. At least they are transparent about their bigotry, hatred, and desire to "get back to" the America that gave us institutionalized racism. I love satire and I was wondering why there wasn't more of it with all these clowns and idiots in the republican party. Now I'm at least a little satisfied! Okay, so there are around 6 people there and one yahoo is dressed in an elephant costume. How is this news?? CIrcus is the right word! These radical right wingers have no solutions, but the same old trickle down economics, that has never worked and never will, and they are so obessed with bashing our President, filling the airwaves with hate and lies, and conspiracy theories, because they have no solutions to the real problems the country faces. The Republican candidates are OBama's best friend right now! People are finally starting to see that these candidates offer no new ideas, or solutions, and can only focus on bashing the "Socialists." They make themselves look more incompetent, every time they open their mouths! Some far leftists throw together a group to "mock GOP debate" and it becomes news on CNN. Gee, no bias there. Now that's real mature......fits the level of antics as those in the White House. Nice game of following the leader. Yep. All six of them. Here is a message from a senior Independent voter; the behavior of the once-proud Republican party has been totally shameful since Barack Obama became president and there is absolutely not way I would vote for or financially support any Republican candidate. Not one senior Republican stood up to the "birthers" and told them to knock-it-off and that President Obama is an American. They are all afriad of the Tea Party group if they attempt to speak the truth. Everyone one of them should hang their heads in shame!